Synopsis: Alex: school psycho and under-ground cage-fighting champion. Kyle: talented artist, smart school-boy and funny man. When Alex witnesses a brutal murder at the club he can't go back to The Cage, but without fighting, he starts to lose control. He soon sets his sights on Kyle, a boy he thinks can help. But Kyle has his own problems and he's convinced Alex is one of them. Boys can play dangerous games when they're scared and this one will haunt everyone involved. What will it take for each boy to confront the truth? Alex Crow is not the sort of person you would socialise with. He’s one of those people who has a reputation wherever he goes, and not just any old reputation; Alex is known for his violent outbursts. Most people, including Kyle, think he’s a psychopath, but that’s only half the story. Alex is a young cage fighter, a talent in the lucrative and illegal market of underage fighters. Events will lead Alex and Kyle together, for better or worse, and something bad will inevitably happen – everyone will be looking for someone to blame. Written in the dual narrative of both Alex and Kyle, Clash sucessfully manages to represent both sides of a complicated and intertwined story in which neither Alex or Kyle are fully the antagonist or the protagonist. Alex, who is a rather brutal but intelligent teenager, is often looked at with distaste from his classes, has lost his way in life, and eventually finds a way out of the mess. Kyle is a talented artist, a joker with a small group of friends, and has a strong view of right and wrong- and more than once Alex crosses the line. The juxtaposition between the perspectives of the two very different characters offers some fascinating insights and conflicts, and emphasizes the importance of having a balanced perspective. Sympathies are spilled on both sides of the fence, though it is Alex who really intruiged me and had me rooting for his redemption simply for the fact that he had been accused of so many things for which he wasn’t to blame for. On the surface, Clash may seem like an unusual gritty teen read, but more than anything it’s a story of friendship and redemption. This unexpected extra dimension is what makes this great book stand out from the crowd. I was touched by Alex, his naievety of friendship, and also his willingness to put things right. Colin Mulhern has definitely produced some fantastic characters which, like all humans, have flaws and strengths. Colin Mulhern’s prose is wonderfully fluid and provides a strong foundation upon which the story can take place. I was impressed by the way it was so easily read and yet conveyed so much, both in detail and in the characterisation. 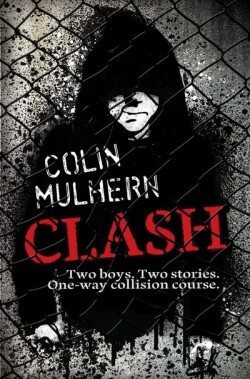 Clash is a gritty, tense and punchy novel which is far more than a cheap action read. Beneath the brutality, two human stories of guilt, anger, consequence, and redemption make Clash a fantastic novel that explores two different perspectives and manages to do both justice. Clash doesn’t just provide the ‘catastrophic sequence of events’ the synopsis hints at; it provides a strong human voice of right and wrong. Clash is an original debut novel from what I hope will be a string of novels from such a talented author. What did you think about Clash? Gah, that’s so annoying! I very nearly but didn’t pick this up from the library… 🙁 I’ll have to get it next time I go 😀 Great review!